and all types of small building projects. 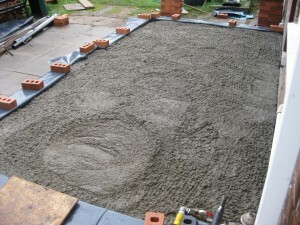 First things first ~ WE WILL SUPPLY THE CONCRETE FOR YOUR FOOTINGS. 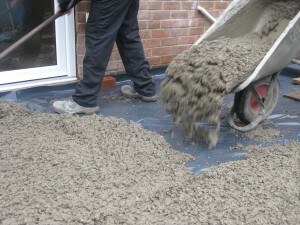 Then agree a day to deliver the concrete, ready mixed to your specification, for your floor. WE DELIVER IN TIMED SLOTS – So the project can be planned efficiently. Schedule Your Concrete Delivery Here. We take your order over the phone. If you’re not sure how much concrete you need, just give us the measurements and we’ll work it out. Or use our really simple Concrete Calculator. 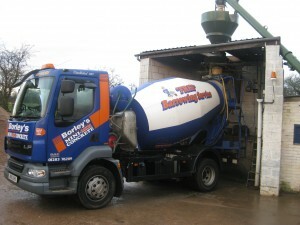 We agree a timed slot delivery and get to work on mixing your concrete. Once on route we will text you so that you know we’re on the way. Your delivery vehicle is tracked on route because we know that your schedule is critical. We arrive on site and on time, and there is NO WAITING CHARGE. 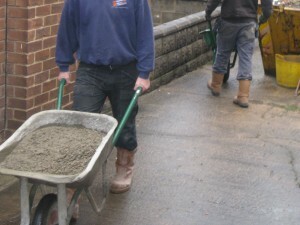 We bring our own barrow and provide our FREE BARROWING SERVICE to get the concrete in place. We do not just leave it in a pile. 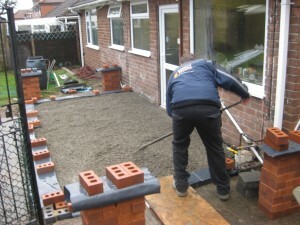 We will barrow it, shovel it and rake it for you – ready for your builder to carry on with the job. We only use as much as needed and remove any surplus. 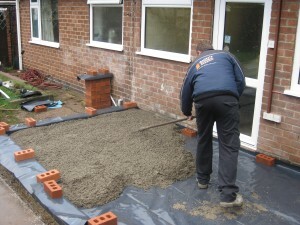 Once your concrete is raked over it’s ready for your builder to take over. Job Done ? Not quite. Our team will clean up any mess or spillages before they leave. All part of the Borley’s service. 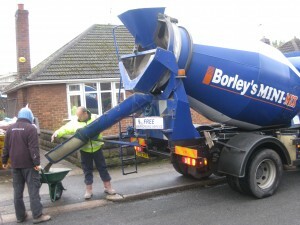 The shots, above, are from an actual Borley’s concrete delivery in Derby. 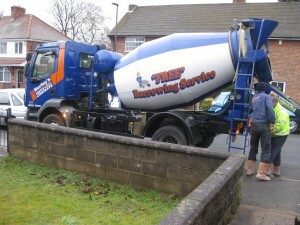 The mix arrived at the property at 10am – the team were cleaning the road and pavement and on their way by 10.15am.